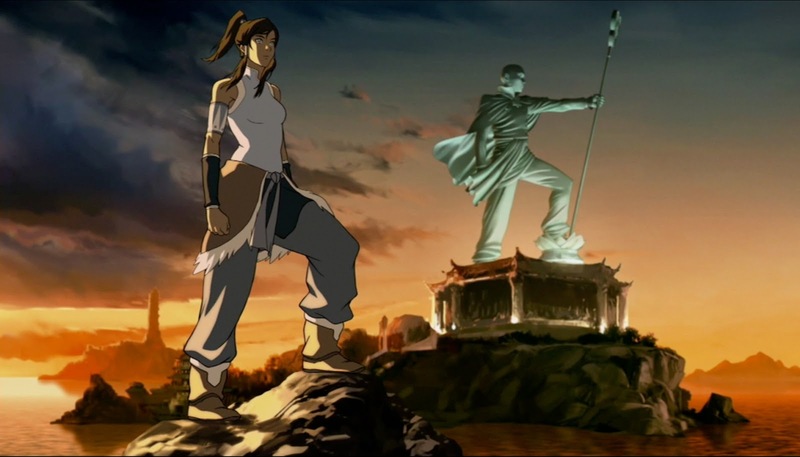 Avatar introduces us to the concept of bending, the ability of certain individuals in society to manipulate the elements of earth, air, water, and fire through martial arts techniques. Bending is a learned skill, but the latent ability is genetic and somewhat random. The world of Avatar is entirely structured around bending, both geopolitically (almost everybody is a member of one of the Air, Earth, Water, or Fire Nations, with conveniently color-coded outfits) and within each nation. With powerful magic users running around everywhere, non-benders necessarily take a subordinate role in their respective societies, and their inequality is basically taken for granted. Within that world the Avatar exists as a sort of benign demigod, the only being capable of bending all four elements, along with the ability to harness powerful spiritual energy (which is very literal: spiritual beings actually roam the physical world for good and evil purposes, plus there's a whole world of spirits only the Avatar and a few others can access). The Avatar, who reincarnates as a member of a different nation each generation, exists to bring balance to the world. On a practical level that means using diplomacy and sometimes violence to reinforce the status quo. But, as the introduction to Avatar tells us, everything changed when the Fire Nation attacked. The story of Avatar: The Last Airbender is that of a young airbender Avatar named Aang, who (with his plucky gang of misfit friends) must learn to control the four elements and cope with his troubled past (long story) to save the world from Fire Nation aggression. What makes the Fire Nation uniquely dangerous are its technological and political innovations. Its military is powered by a steampunk-inspired array of battleships and enormous land weapons augmented by fire bending, which far outpace the other nations' capabilities. More importantly, the Fire Nation is governed by a quasi-fascist dictatorship, which perpetuates an ideology of racial superiority and violent expansionism (as the show begins the Fire Nation has already wiped out the Airbenders, save Aang). 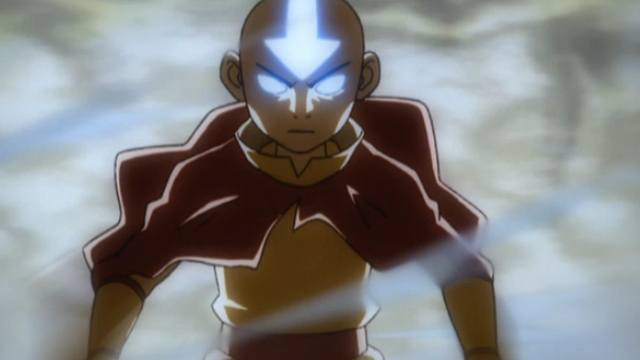 Fortunately, after three seasons and numerous twists and turns, Aang defeats the Firelord, ends the war, and becomes the Avatar he is destined to become. Restoring balance, however, proves much more difficult, as we see in The Legend of Korra. 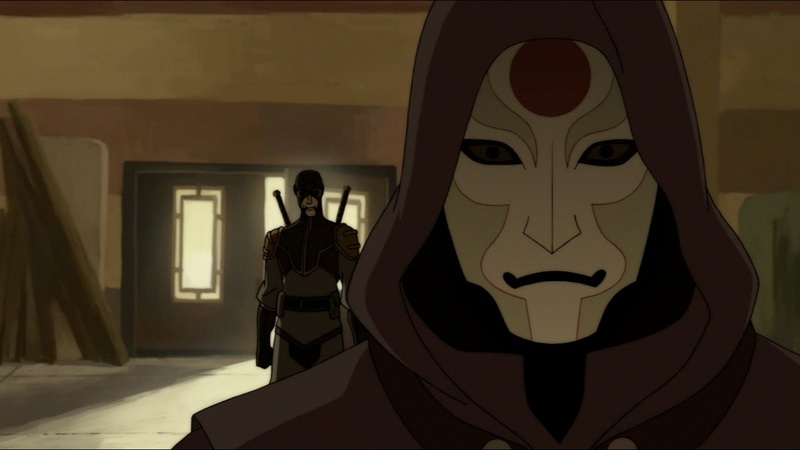 Korra begins 70 years later and tells the story of Aang's successor, a water bender named (surprise!) Korra. We quickly learn from Korra that the societal upheavals of the war in Avatar have had far-reaching consequences. The technologies introduced by Fire Nation's war machine have been updated, commercialized, and commoditized, creating an emerging industrialized and urban society. 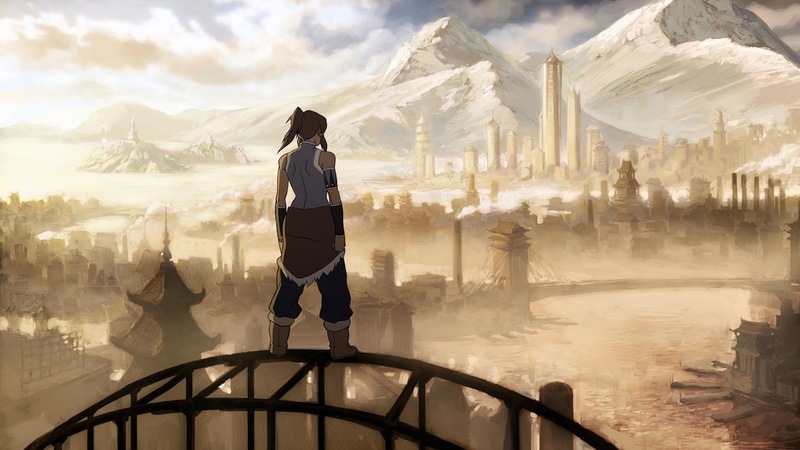 Korra's primary setting, Republic City, is a young but thriving city-state built after the war, in which all benders are welcome and each nation has equal say in its government. So far so good. But Republic City's cosmopolitan facade hides fractures in the entire structure of the bending world, which soon break, leading to rapid revolution, collapse, and reinvention both in the city and elsewhere. Season 1 introduces the Equalists, a shadowy movement of non-benders dedicated to ending Republic City's lingering caste system. With technology finally placing non-benders in a position to compete with benders, the Equalists represent the vanguard of demands for democracy and political equality (in a terroristic, IRA sort-of-way). Although they become the Korra's antagonists, by our modern, liberal standards their critique of bending society is fundamentally correct. The Equalists are a sign of a new political consciousness emerging from a marginalized class of society, which probably has all sorts of neat Marxist implications for anyone better versed in that theory. In Season 2 there is further disruption as the Water Nation goes to war with itself when one of its leaders attempts to gain control of the Spirit World. This ultimately destroys the divide between the two worlds, introducing a new spiritual/temporal dynamic that both upends society and fundamentally alters Korra's powers. Spirits and spiritual energy, which represent a kind of naturalistic mysticism, begin intruding on the metallic, industrial Republic City, sometimes violently. Again, someone who knows their Rousseau could have a field day with this. Season 3's baddies are anarchists opposed--with good reason--to the arbitrary and often harmful distinctions between the nations and to the Earth Kingdom's repressive monarchy. Their actions lead to the overthrow of the monarchy and chaos in the Earth's Kingdom's sprawling, rigidly hierarchical capital city Ba Sing Se. Finally, Season 4 begins with the Earth Kingdom reunited forcibly under banner of the Earth Empire, a nationalist military dictatorship with enormously powerful weapons based not on bending, but on superior technology. In every case Korra, as Avatar, finds herself attempting to fight against threats to the old order--an order she sees can be unjust--to restore a balance that she increasingly realizes can never exist again. At various points she has to confront the Avatar's seeming impotence and irrelevance in dealing with the new, modern world and its complicated threats. The new technologies and political ideologies emerging from this anarchic/democratic/totalitarian chaos render her increasingly, and perhaps necessarily, obsolete. 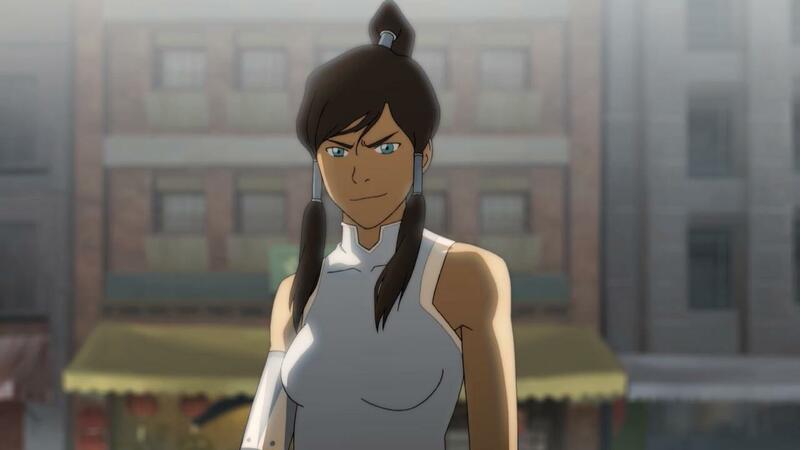 Ultimately, however, we root for Korra because she is likable, loyal, and incorruptible. I loved watching her mature from a bullheaded, impetuous teenager to a thoughtful, strong woman, which the show handles deftly. Korra the person, not just Korra the Avatar, comes to exist as more than a force for balance. She represents good in a world where it's not entirely clear what that means. Korra, like Aang, eventually overcomes against all odds, leaving the world a better place. But by showing how actions, good and bad, have persistent consequences, The Legend of Korra refuses to take the easy way out. Between the beginning of Avatar: The Last Airbender and the end of The Legend of Korra the world has been irrevocably remade several times. Whatever Aang restored and whatever balance Korra and her successors create will be something new, something untried, and something that may eventually fail. 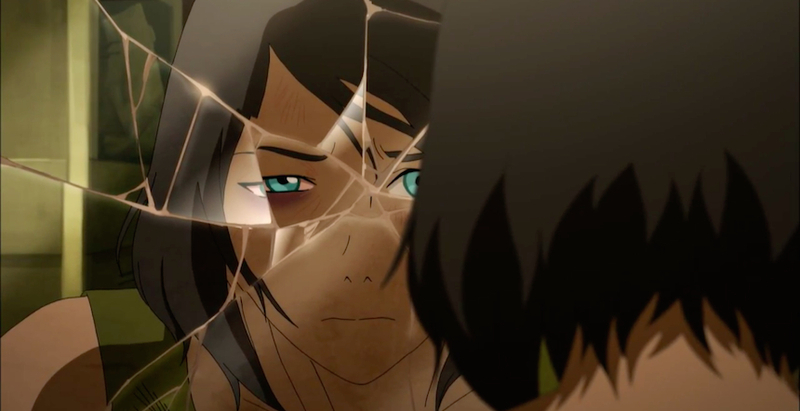 Avatar and The Legend of Korra remind us that in a modern/postmodern/whatever world, we ought to do the best we can, remembering that any balance we find may turn out harmful, fragile, and--maybe, if we're lucky--cause for renewed hope.